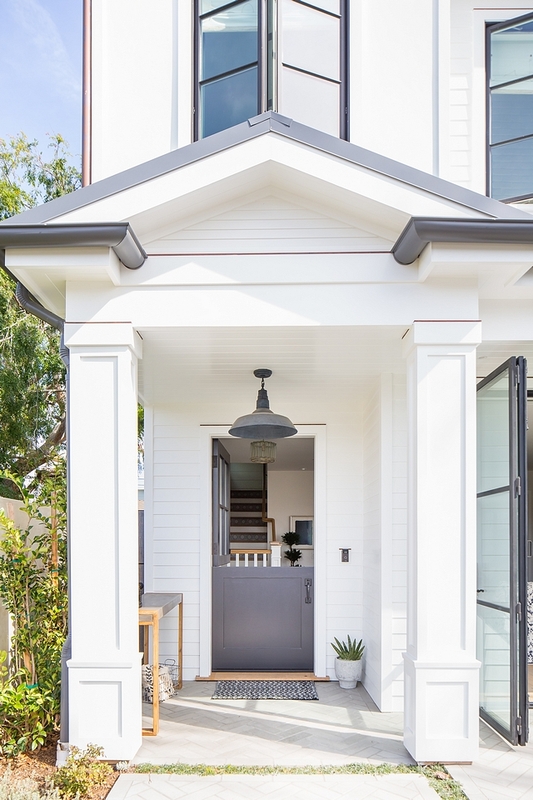 There’s no question that modern farmhouse is the most popular home style and this type of home is being built from coast to coast, even reaching and changing many quaint streets of beach towns in California. Built by Graystone Custom Builders, Inc. (they created and provided all of the interior details associated with the home, including cabinetry, wall treatment, flooring, etc), interior design by Blackband Design (they worked their magic with furniture, textiles and window coverings) and architecture by Teale Architecture, this home offers all “modern farmhouse must-haves”, such as shiplap (and lots of it! 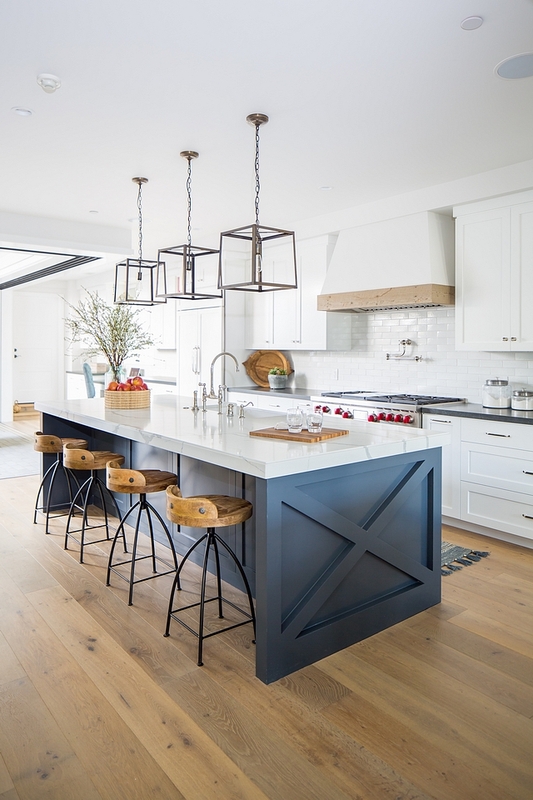 ), white oak plank hardwood floors, black windows, board and batten siding, painted brick, reclaimed barn wood, barn doors, barn lights and comfy decor that, although beautiful, is far from being stuffy. 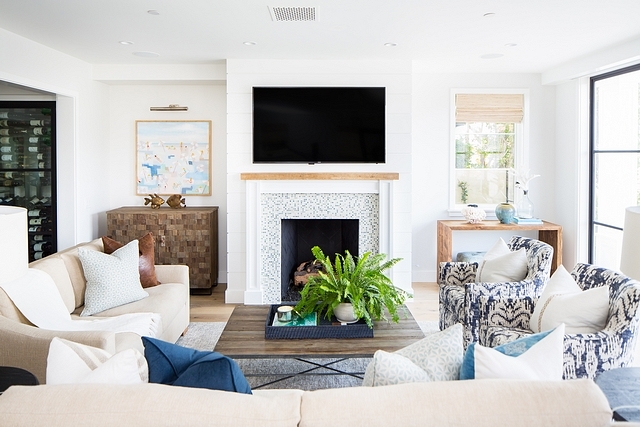 “A local family with three college-age daughters built their dream home in Corona del Mar, and we had the pleasure of furnishing it! 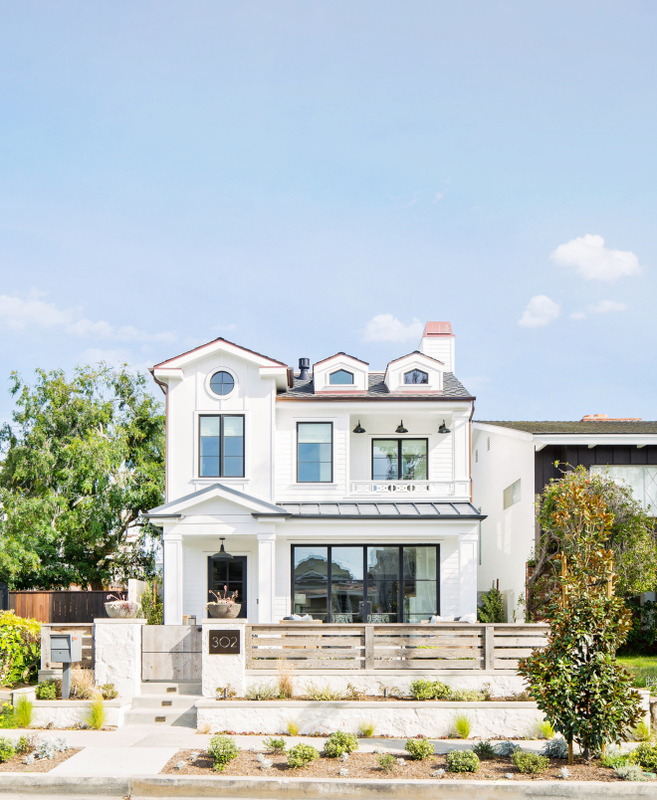 The build is a classic Graystone Custom Builders; clean, coastal style with splashes of fun tiles and finishes. 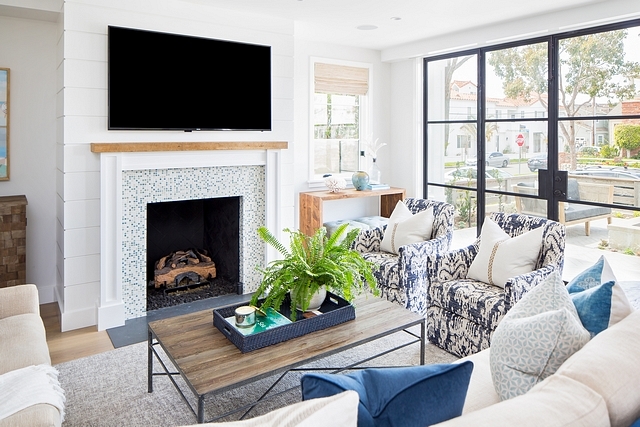 We continued this balance of aesthetics bringing in staples such as neutral linen sofas and reclaimed furnishings while incorporating eclectic patterns and earthy-tone accents. 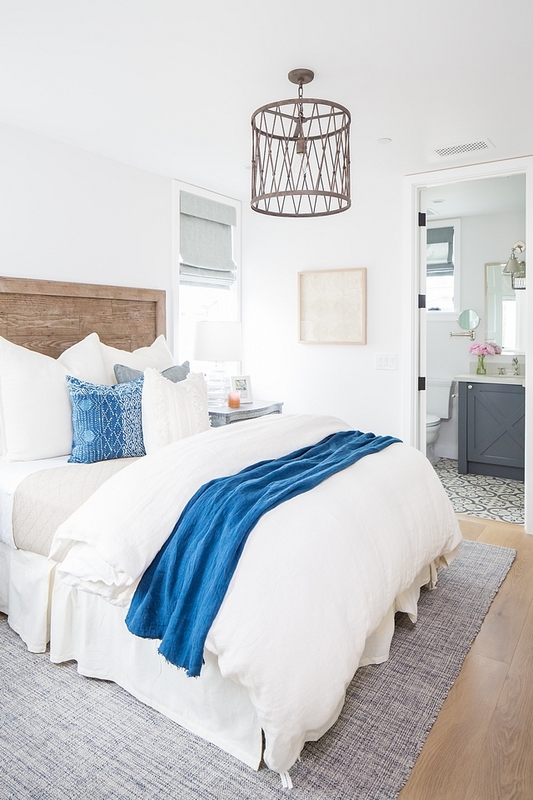 The master bedroom is a serene retreat with a slipcovered bed and bathroom full of amenities, and the three daughters’ rooms with attached bathrooms each reflect their individual personalities. With the limitations of a tight lot in the renowned flower streets, we maximized the space for entertaining keeping an open floor plan on the main living level and including multiple seating arrangements that span the length of the rooftop deck (there’s even an elevator to get you there!). 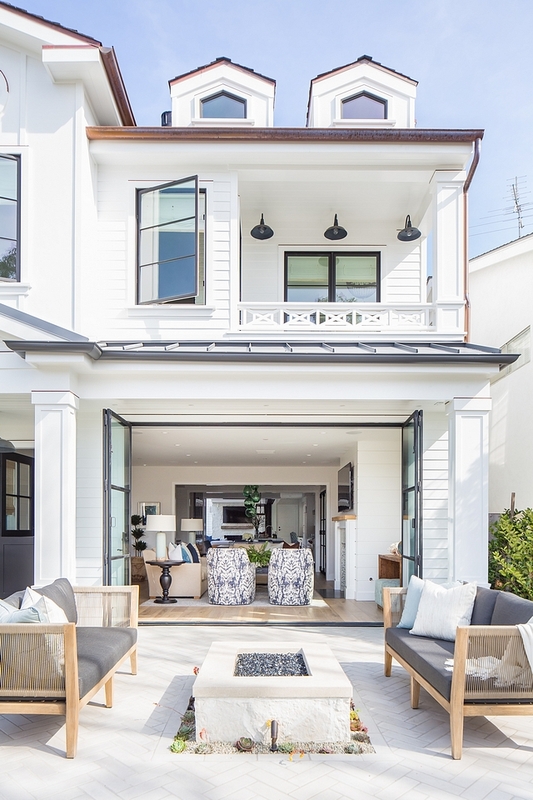 The home opens to indoor/outdoor living on the front patio and back courtyard with sliding doors and furnishings that flow seamlessly to expand entertaining and living spaces once again.” – Katie from Blackband Design. 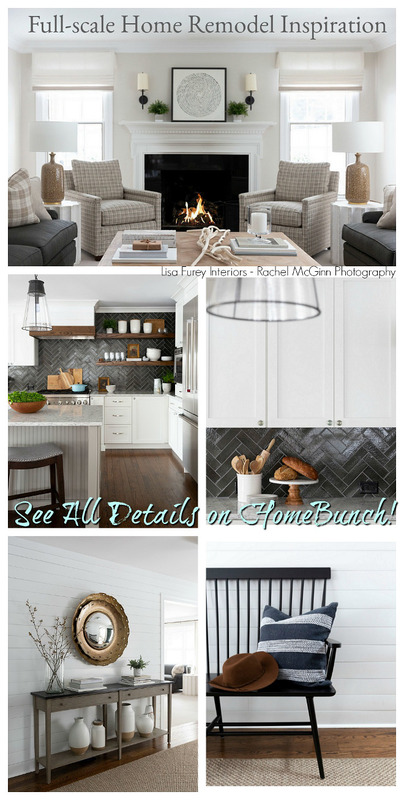 Take notes on all details kindly shared by this talented builder and interior designer. 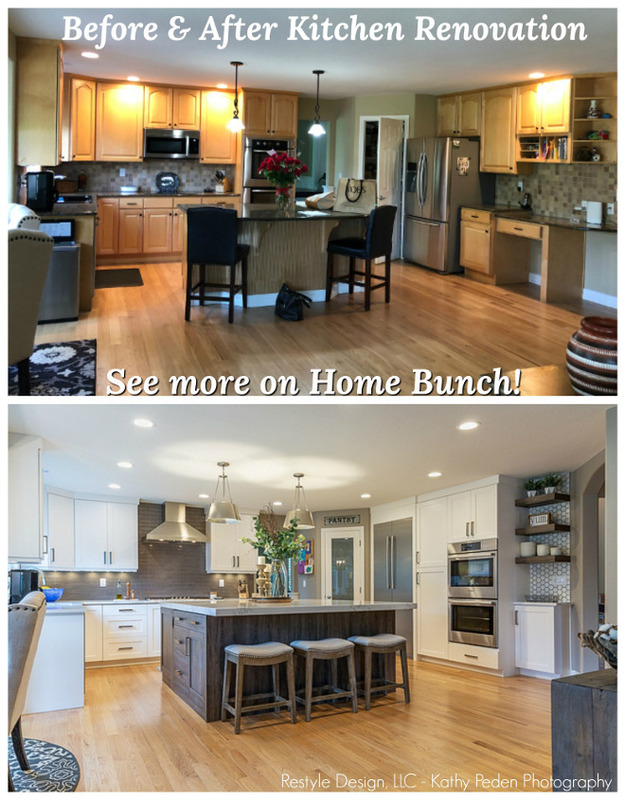 It’s easy to see why I am featuring this gorgeous home today, right? The architectural details are impressive and they weren’t compromised because of a narrow lot. The exterior features over grouted stone walls and wood fence. Sofas: Teak Warehouse, Ventura Reclaimed Teak Loveseat- Other Beautiful Outdoor Furniture: here, here, here, here & here. 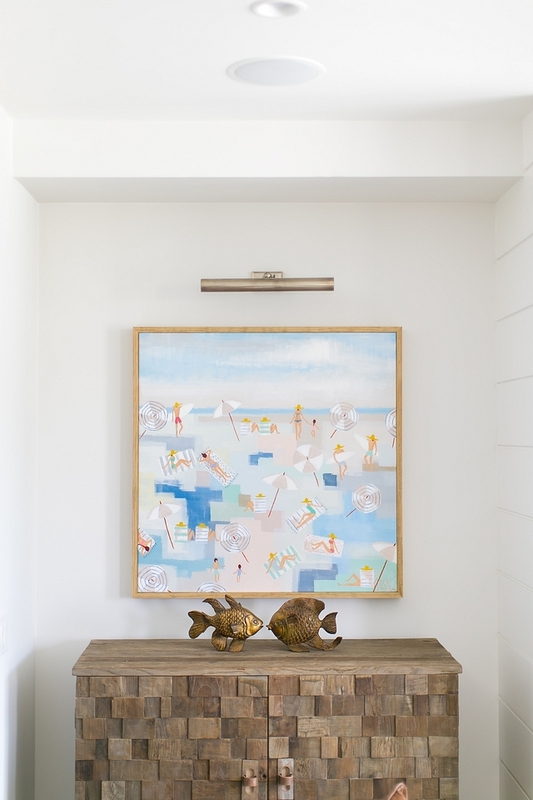 The interior of this home features a welcoming coastal bohemian vibe. Notice that the staircase is accentuated with blue and white patterned tiles. 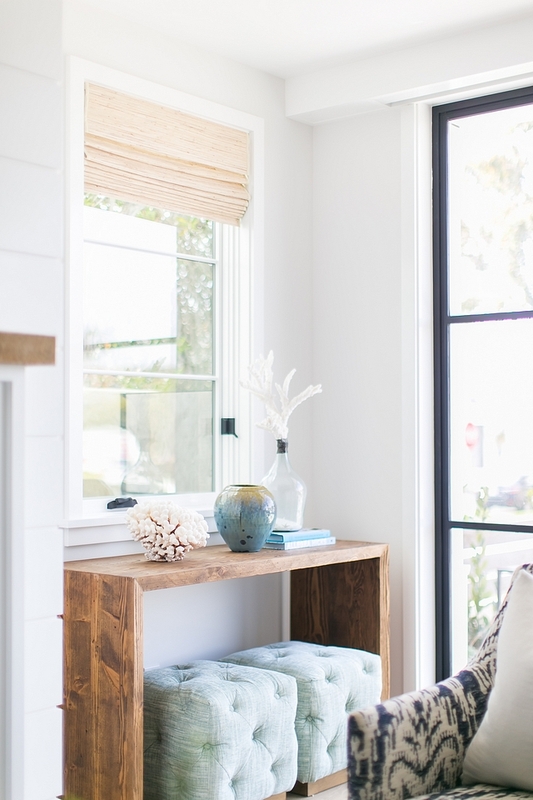 Entry Bench: Blackband Design, One-of-a-kind – similar here & here. 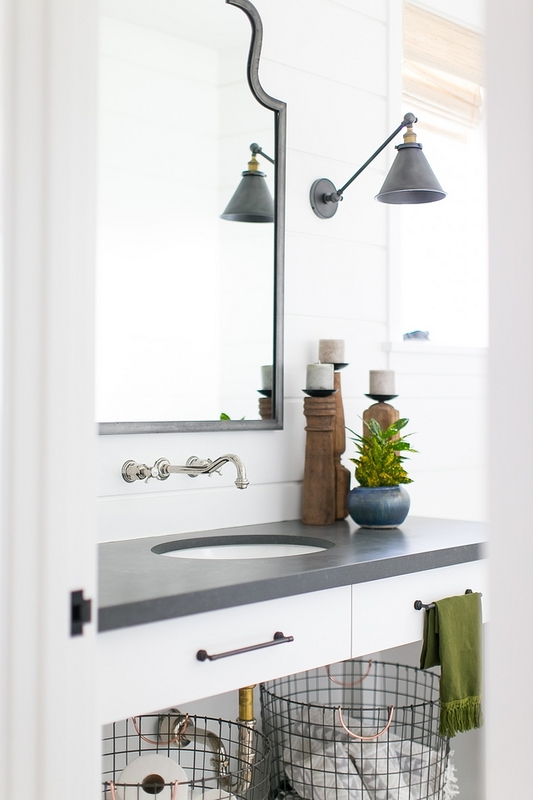 Industrial Sconces: Cisco Home Maria Sconce – Others: here, here & here. Chandelier: Currey & Company, Bevilacqua Pendant. 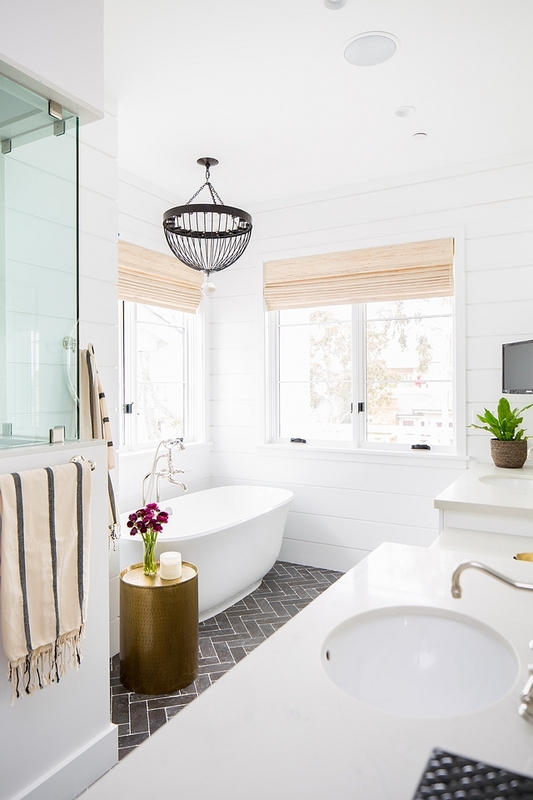 Continuing the builder’s balance of clean, modern design and eclectic finishes, the designer brought in staples such as neutral sofas and reclaimed furnishings while incorporating patterns with a bohemian flair and earthy-tone accents. 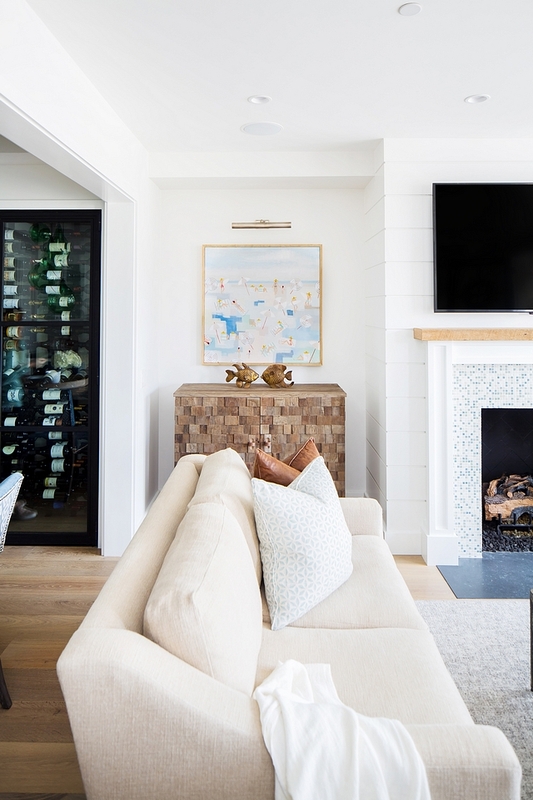 Walls and fireplace shiplap are Dunn Edwards – White – DEW380. Coffee Table: Gabby, Isabelle Coffee Table – Other Beautiful Coffee Tables: here, here & here. Console: Blackband Design, Custom – similar here. Ottomans: Lee Industries, Custom – Others: here, here, here & here. Beautiful Home Decor: here, here, here, here, here, here & here. Sofas: Blackband Design, Custom – available through the designer. According to the builder, they get involved in the interior design details with their clients early on. They love adding texture to ceilings and walls throughout the home. For this dining room, they chose a reclaimed wood ceiling detail which complimented the wine wall designed by the homeowner. 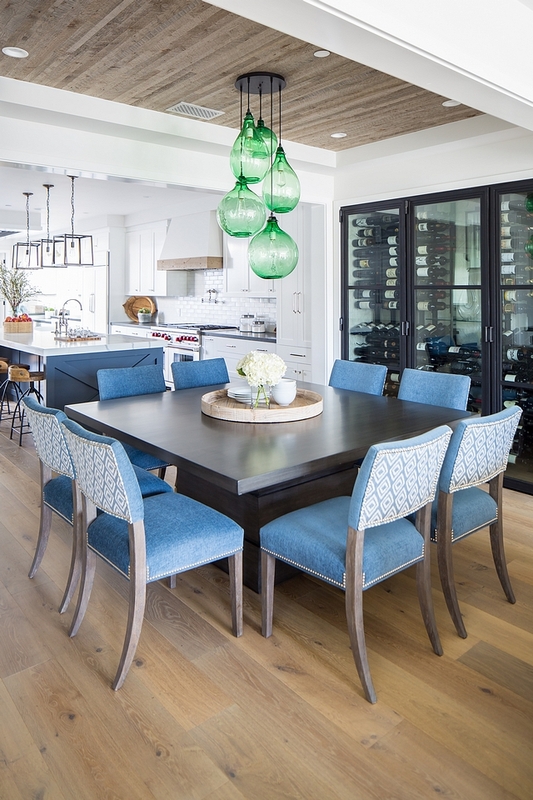 Their design team selected the custom Green blown glass jug cluster lighting. Lighting: Cisco Home Custom Jug Cluster in Emerald Green – Others: here, here, here, here & here. Dining Table: Blackband Design, Custom – Others: here & here. Side Chairs: Bernhardt, Moore Side Chair with custom upholstery – Others: here, here, here & here. A butler’s pantry is located on the other side of the dining room, just across from the table. Cabinet Hardware: RH – similar Pulls & Knobs. 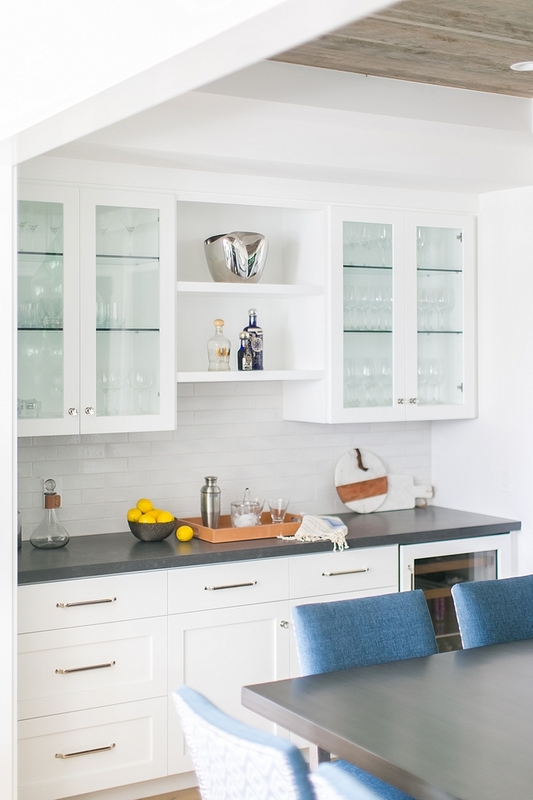 Painted White Brick Backsplash: Mission Tile West Bison Brick – similar here. All cabinets were designed and built by Graystone Custom Builders, Inc.. 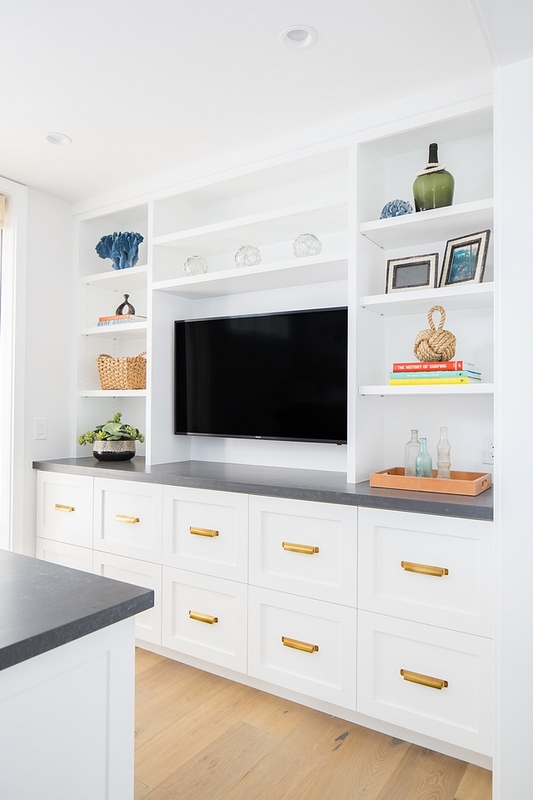 They chose a clean shaker-style cabinet throughout the house to keep the overall style clean and simple for the clients. “We added an “X” detail to the kitchen island to add a little spark to the simplicity of the shaker cabinets. We also introduced a reclaimed wood band on the custom range hood to compliment the ceiling detail in the adjacent dining room. 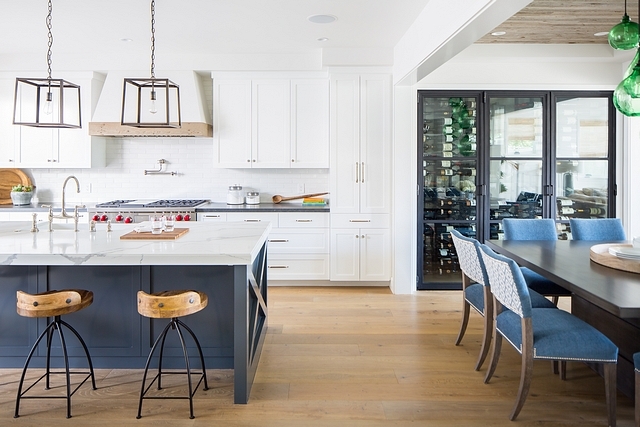 The kitchen Island was painted Benjamin Moore Deep Space 2125-20.” – Graystone Custom Builders, Inc. 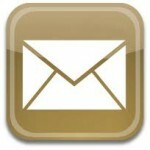 Lighting: Custom by Graystone Custom Builders – Other Affordable Options: here, here, here, here, here, here, here & here. 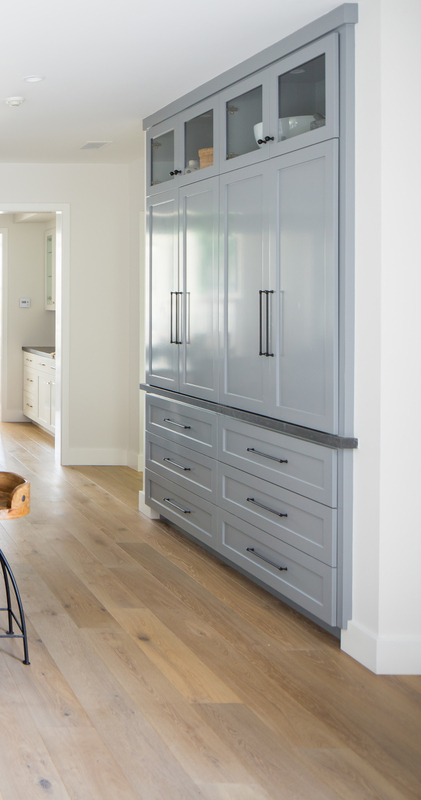 The white selected for the cabinets is the builder’s signature white; Dunn Edwards – White – DEW380. 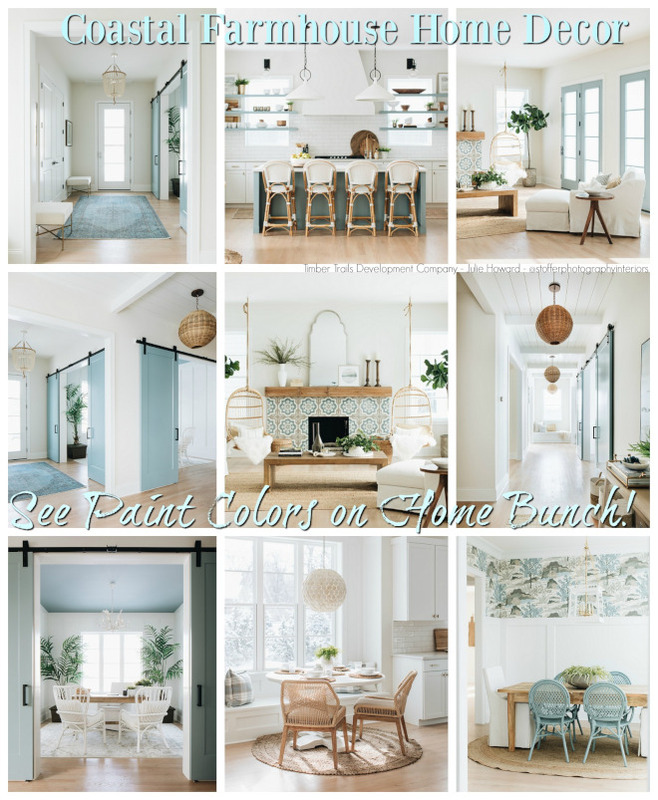 It is their go-to white for walls and trim too. 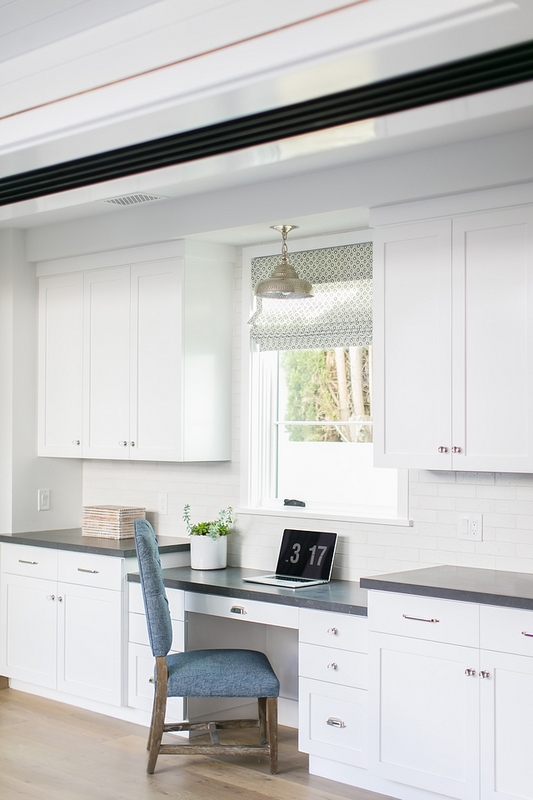 Beautiful Kitchen Runners: here, here, here, here & here. Kitchen Pantry Cabinet: Benjamin Moore 2134-40 Whale Gray. The clients wanted carefree countertops, therefore the builder selected Quartz from Arizona Tile And Stone. The kitchen also features a long cabinet with desk area. This courtyard feels like an extension of the home’s living area. 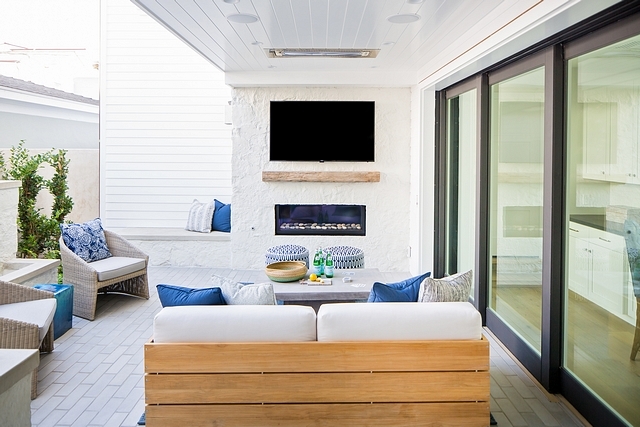 Notice the outdoor fireplace with reclaimed mantel. 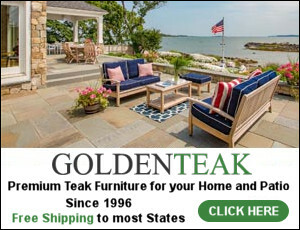 Sofa: Teak Warehouse, Soho Grande Teak Outdoor Loveseat – Others: here, here, here & here. Coffee Table: Chandler Rect. Coffee Table. Rug: Jaipur Living, Nirvana Premium. 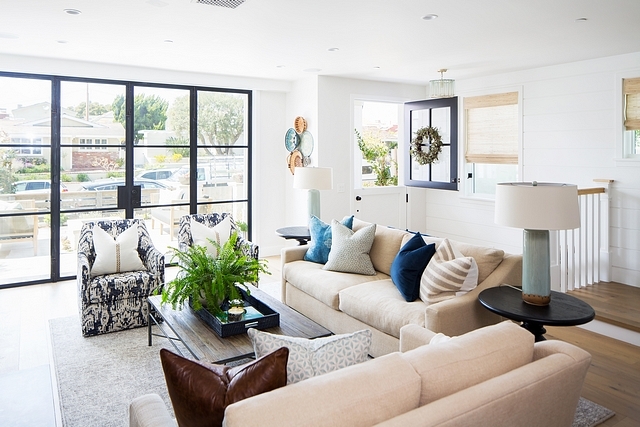 Ottomans: Dash & Albert, Links – similar here & here. 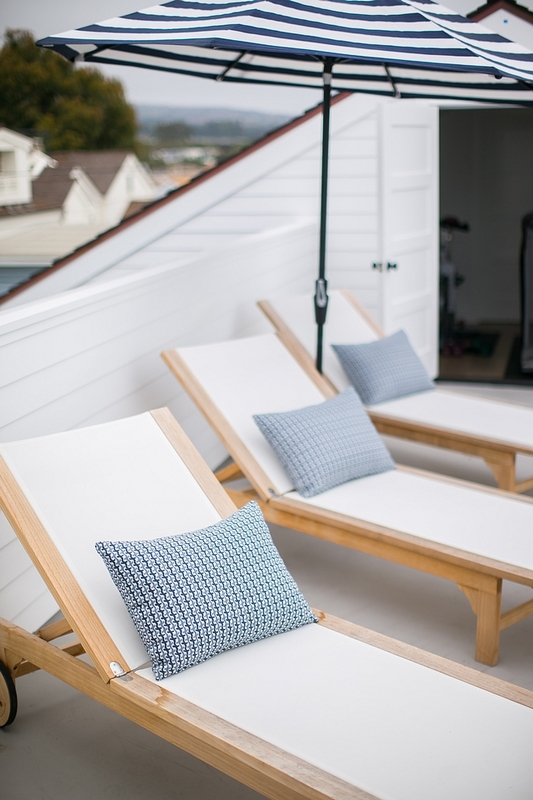 Chairs: Teak Warehouse, Cove Wicker Relaxing Tub Chair. 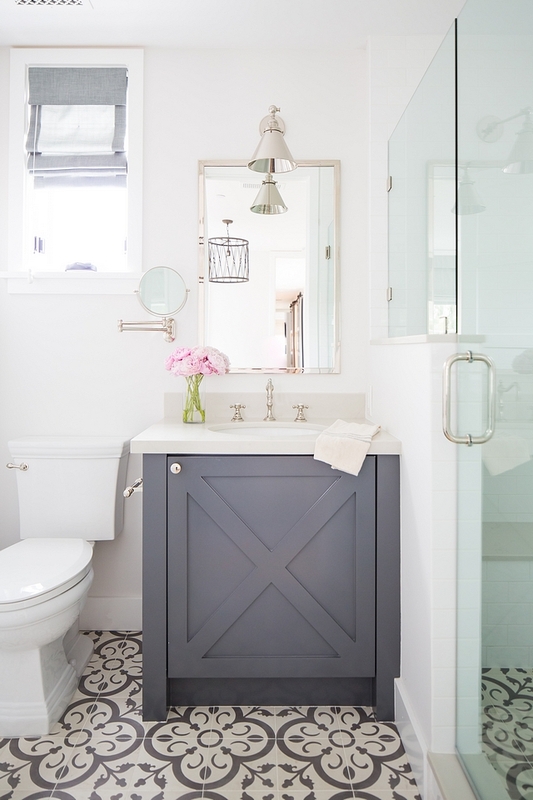 I am loving this powder room. 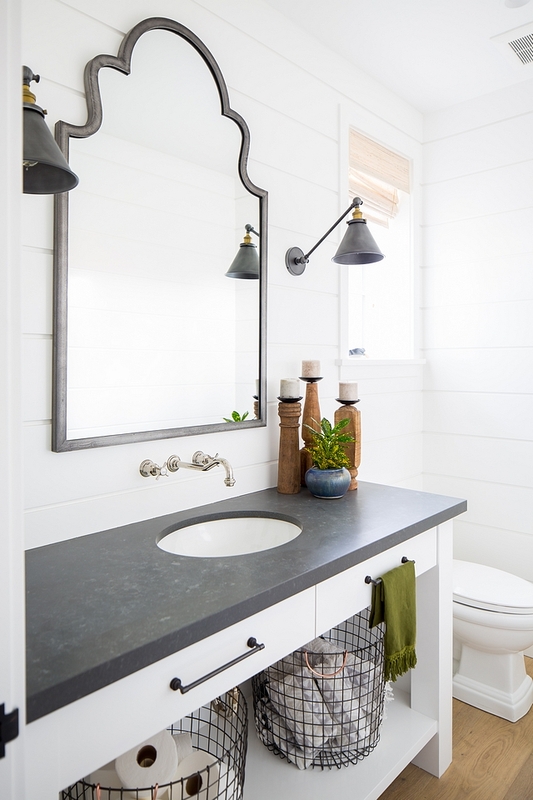 The dark countertop beautifully constrasts with the white vanity and shiplap walls. 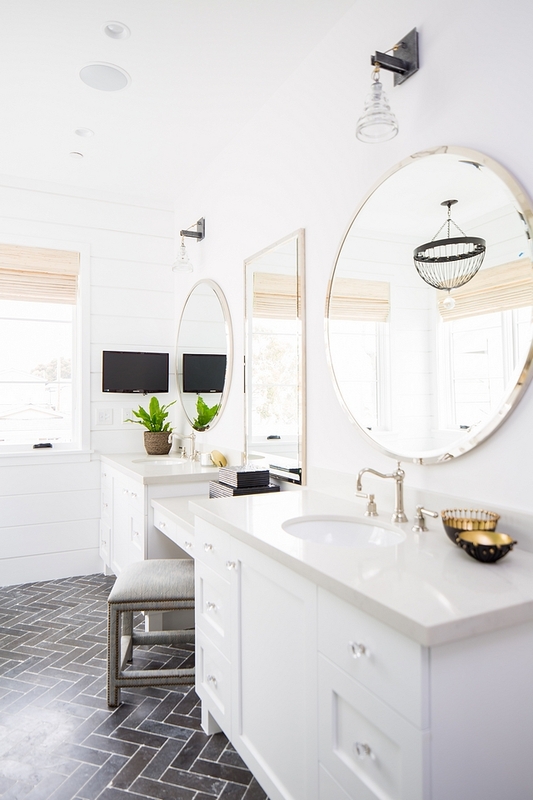 Vanity: Custom by builder – Other Bathroom Vanities: here, here, here & here. Lighting: RH – similar: here, here & here. Metal Baskets: here & here. Countertop is Metropolis Dark Quartz with a leathered finish. Powder Vanity Cabinet: Dunn Edwards White. 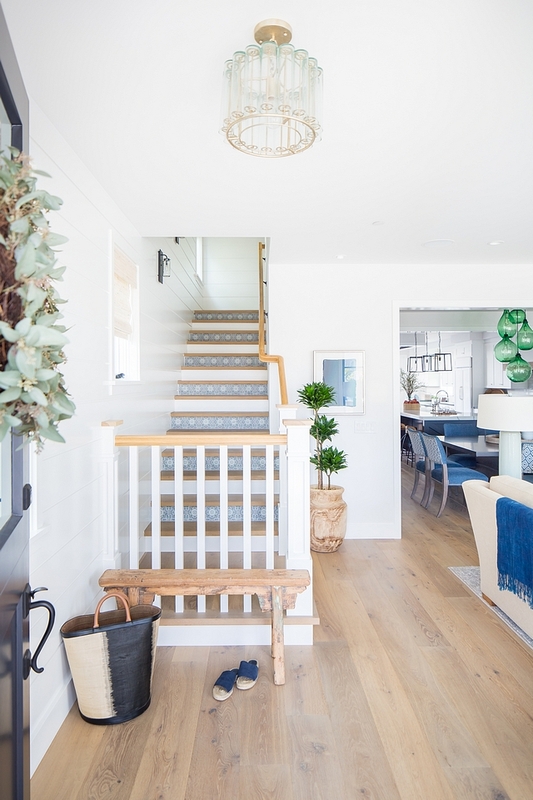 The staircase leads to a long hallway with shiplap and wide plank hadwood floors. 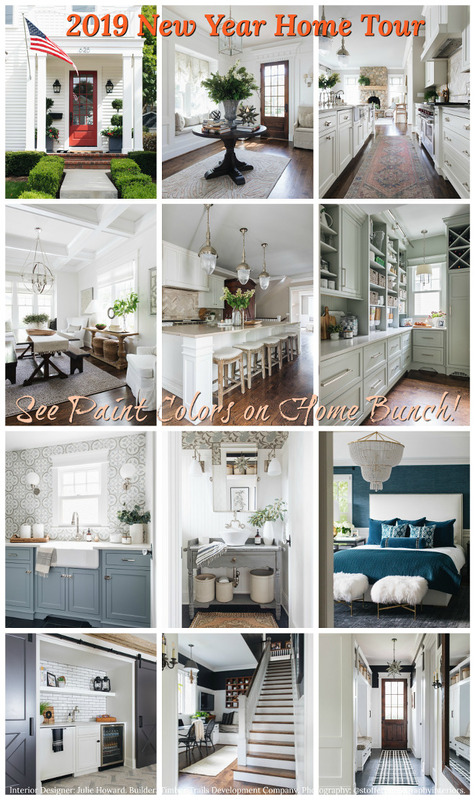 As you can see, you will continue to find plenty of inspiration in this home! Wood flooring is by Warren Christopher (European White Oak custom stain) – similar here & here. 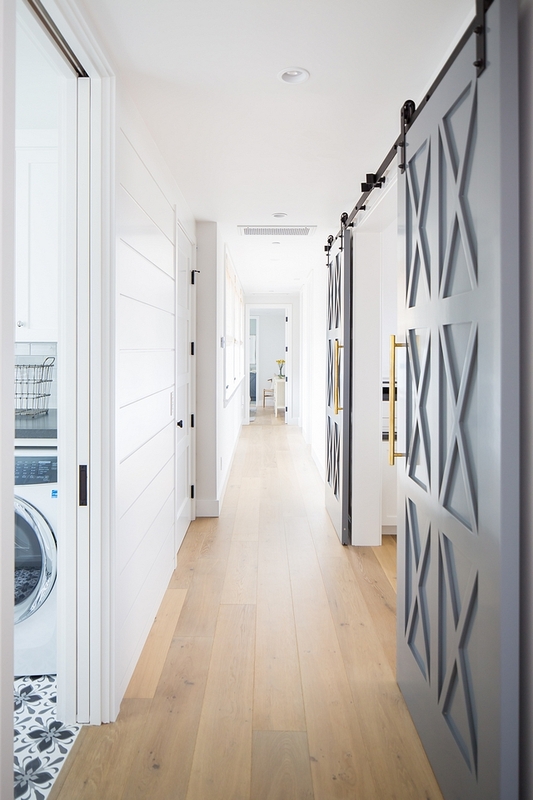 The barn doors were custom designed and built by the builder. Aren’t they gorgeous?! 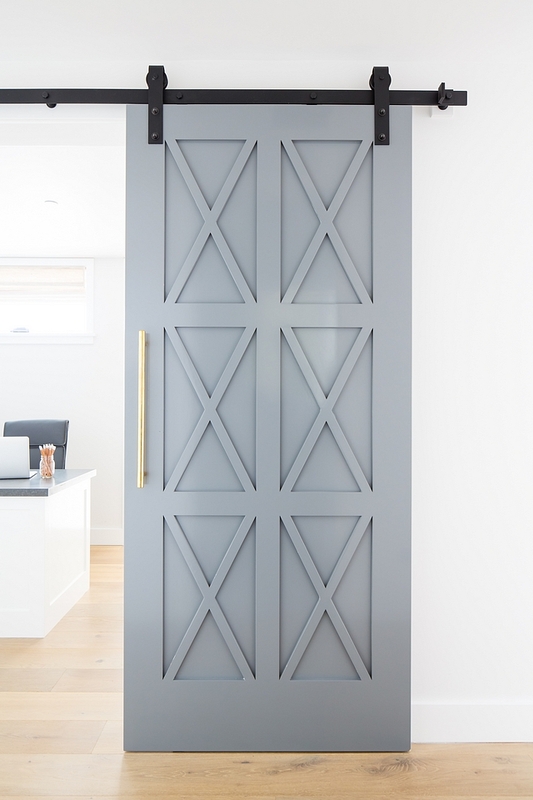 Similar X Barn Door: here. 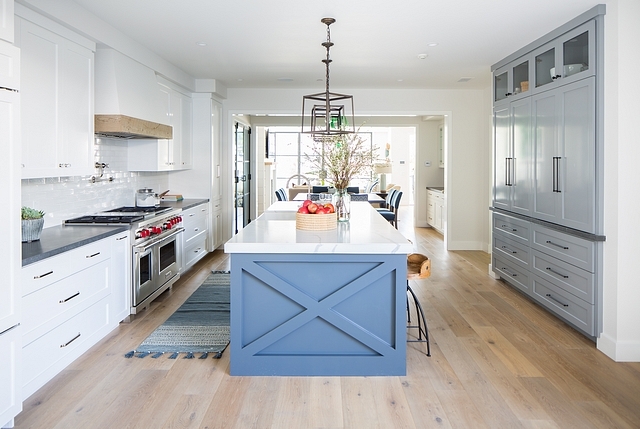 Grey Barn Doors: Whale Gray by Benjamin Moore. Beautiful Pulls: here & here. 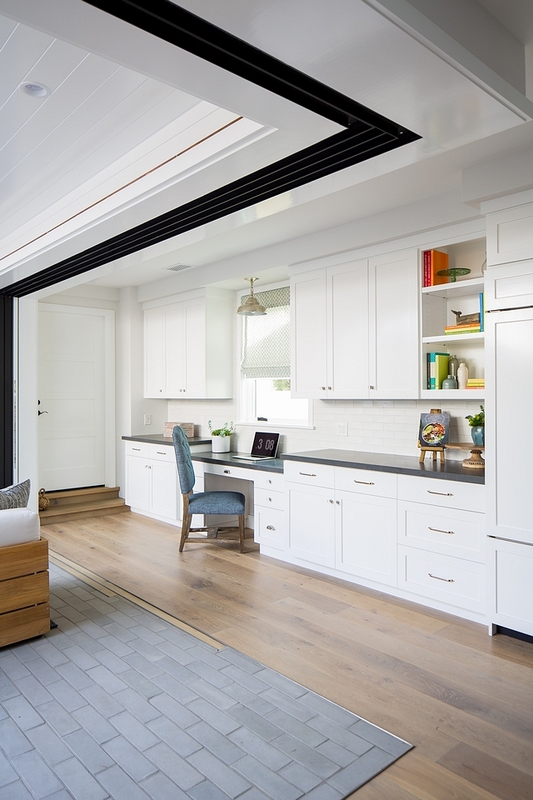 Imagine having a home office with this much storage! Cabinets paint color is Dunn Edwards DEW380. 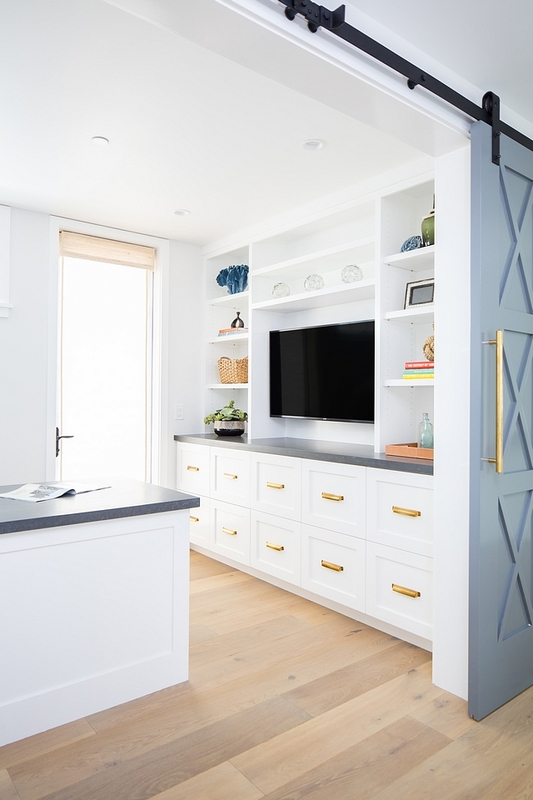 Cabinet Hardware RH – similar here. 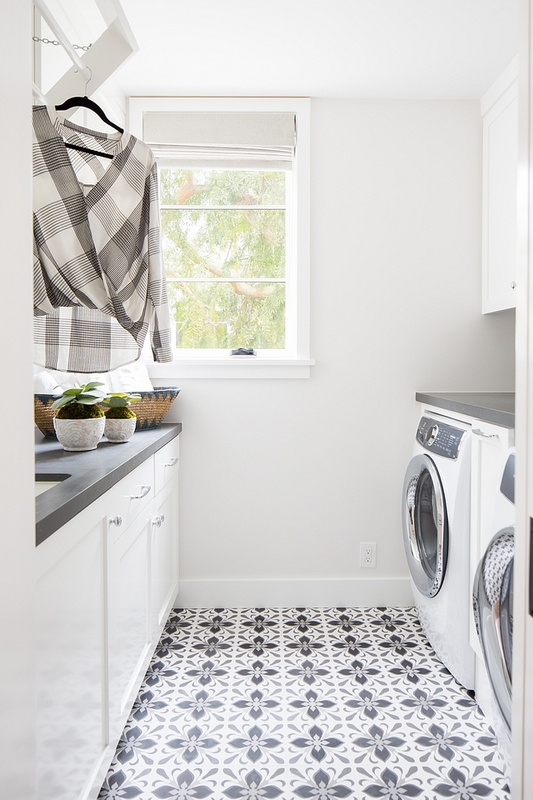 Having a laundry room on the second floor makes life a little easier and I actually wouldn’t mind doing laundry in this beautiful space! Drying Rack: Custom – similar here. Laundry Cabinets: Dunn Edwards White. Floor Tile: Mission Tile West Moroccan Style CH2 – Others: here, here, here & here. All bedrooms in this home feel relaxed and inviting. Tufted Bed: Blackband Design, Custom – available through designer – similar here & here. 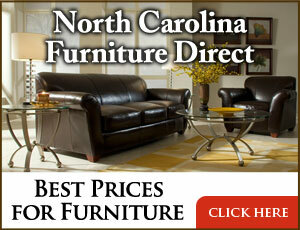 Nightstands: Classic Home – Others: here, here, here, here, here & here. 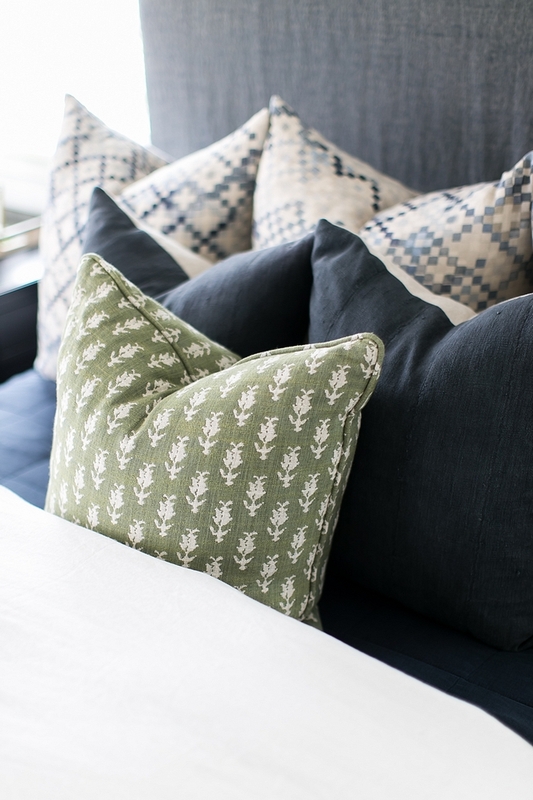 Pillows: Blackband Design, Custom – available through designer. Lamps: Uttermost, Delane Table Lamp. 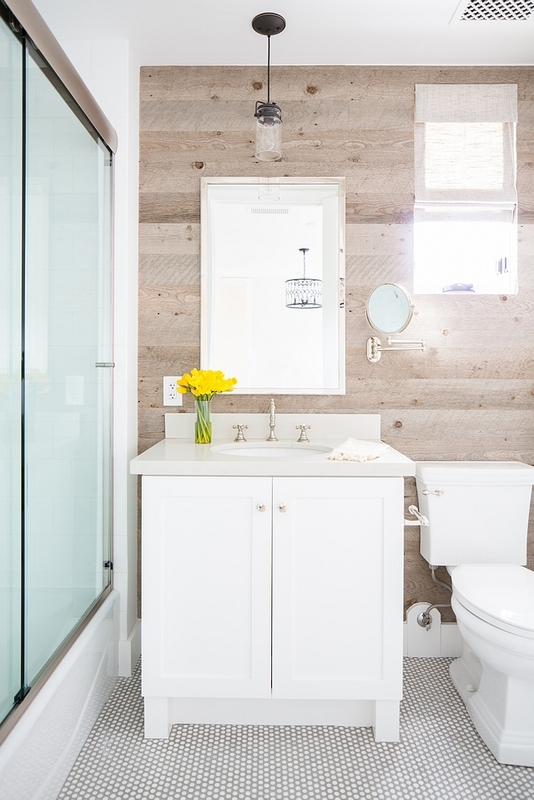 This guest bathroom features reclaimed wood shiplap and round Penny tile. Cabinet Hardware: RH – similar here. Lamps: Arteriors, Toshi – Others: here. 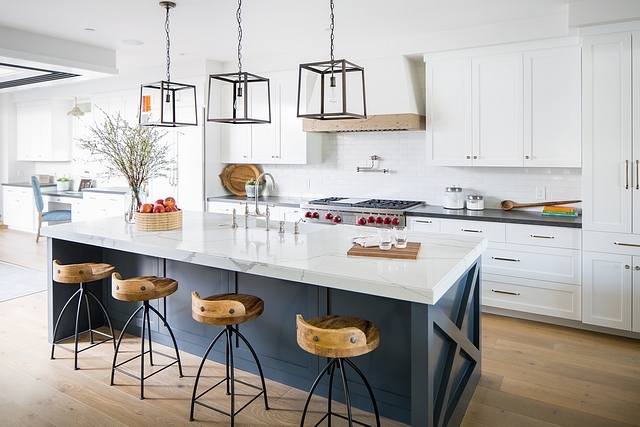 Chandelier: Classic Home, Braylon Pendant Large – similar here, here & here. Beautiful Rugs: here, here, here & here. Dresser: Gabby Home, Naomi Chest. Occasional Chair: Dovetail – similar here & here. 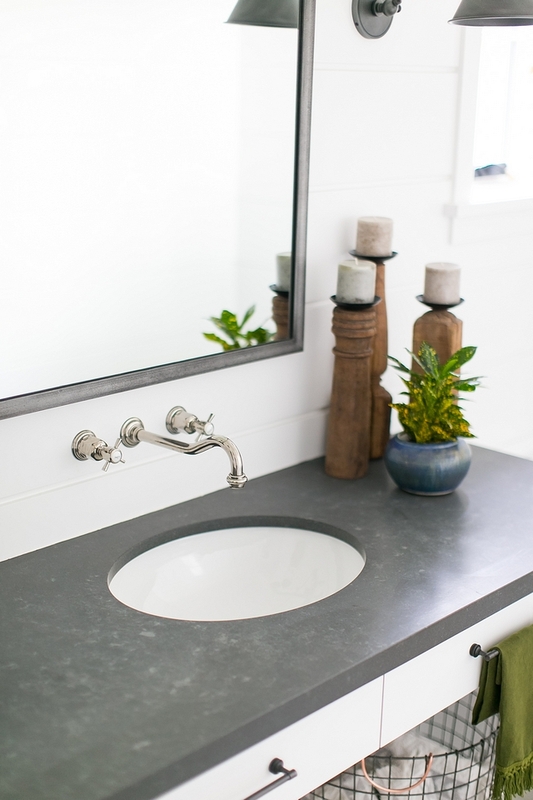 Vanity Cabinet: Benjamin Moore 2112-60 Cement Gray. Lighting: RH – similar here. 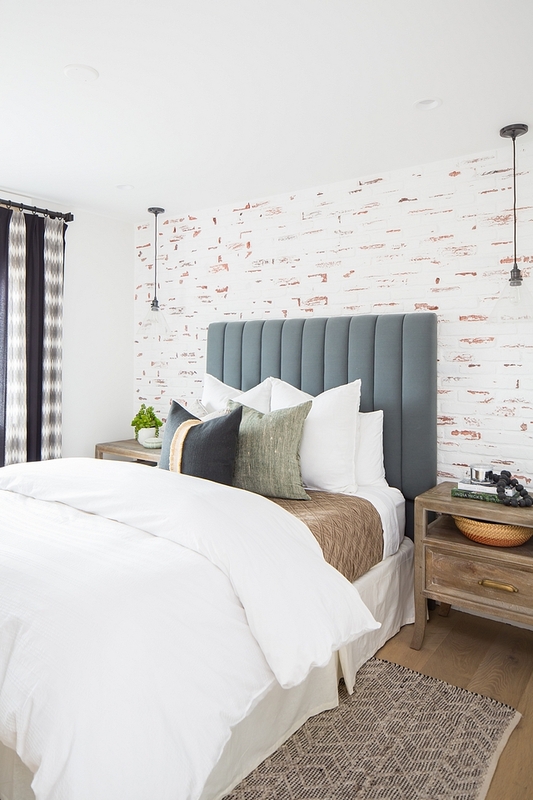 Featuring a distressed painted brick accent wall, this bedroom would be a dream for anyone who loves the farmhouse trend. 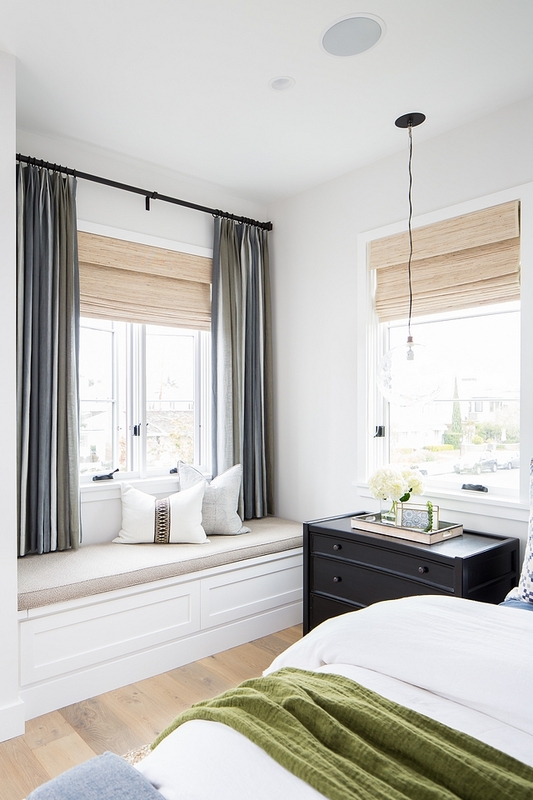 Channeled Bed: Blackband Design, Custom – available through designer – similar here. Nightstands: Classic Home – Others: here, here, here & here. 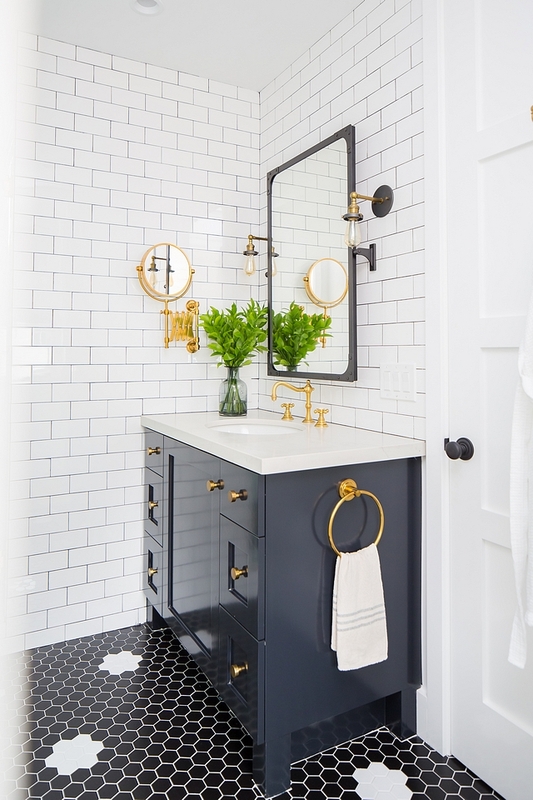 Vanity Cabinet Paint Color: Dunn Edwards Dark Engine DE6350. Cabinet Hardware: RH – similar Knobs. 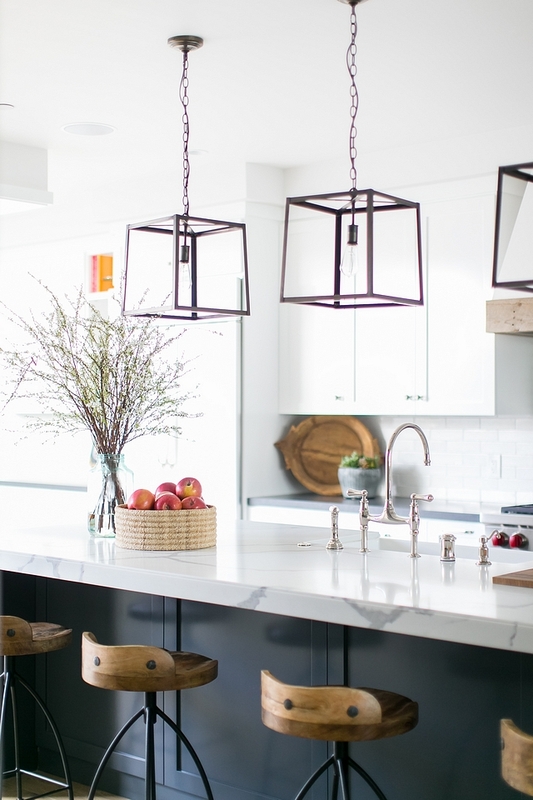 Lighting: Exposed Bulb Sconces – similar. Flooring is a mix of matte black and matte white hexagon tile designed in shape of flowers. Shower Wall: Glossy White Sybway Tile with black grout. 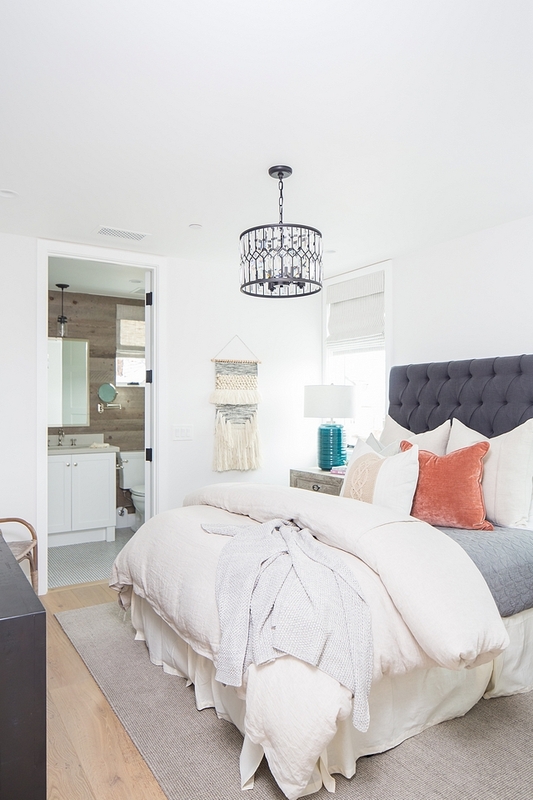 I am in love with this bed and the fresh color scheme found in the master bedroom. Pillows: Blackband Design, Custom – available through the designer. Linen Slipcovered Bed: Blackband Design, Custom – available through the designer. Beautiful Beds: here & here. Nightstands: Noir, Hampton Side Table. 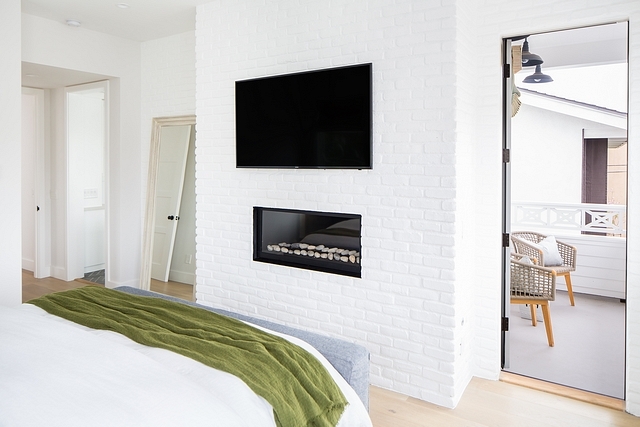 The master bedroom also features a painted brick fireplace and a private balcony. 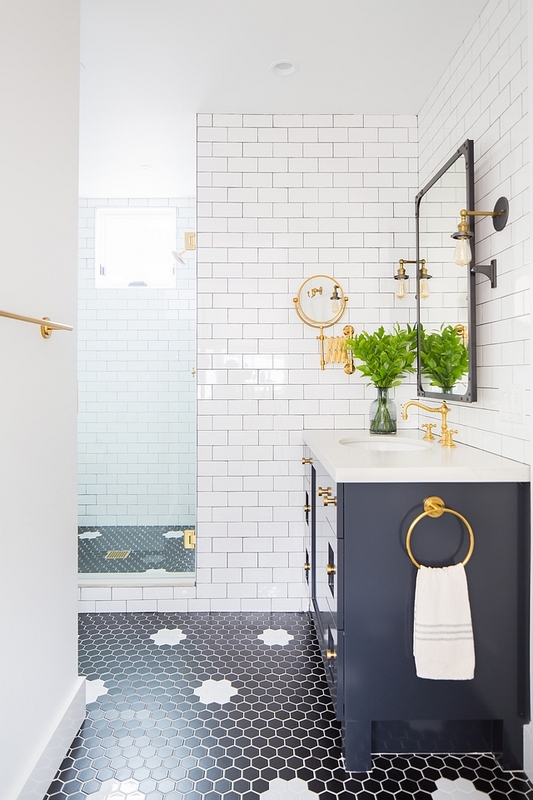 The master bathroom’s layout is perfect if you don’t have much width to work with. Keep this one in mind if you’re building or renovating. 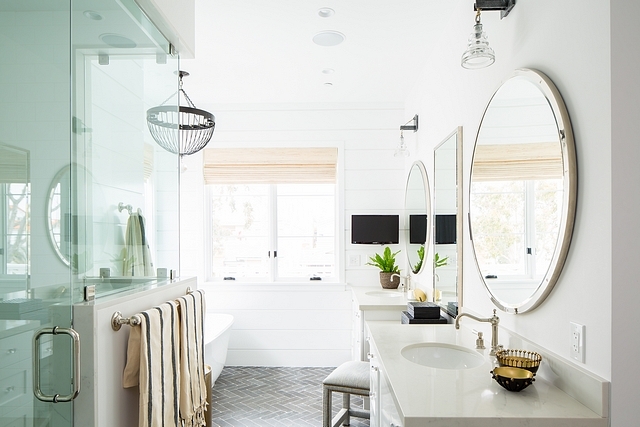 Bathroom Mirrors: Restoration Hardware, Bistro Mirror + Bistro Round Mirror in Polished Nickel – similar Round Mirrors & Rectangular Mirror. 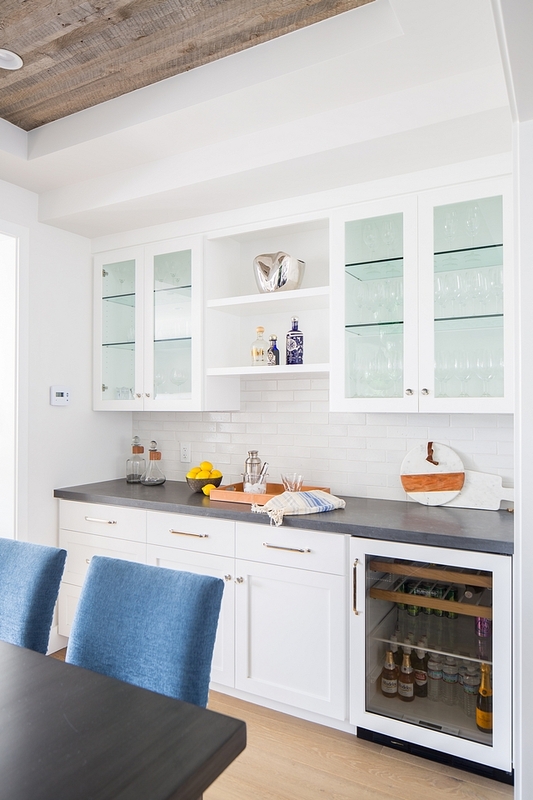 The cabinet paint color is Dunn Edwards White and countertop New Carrara Quartz. 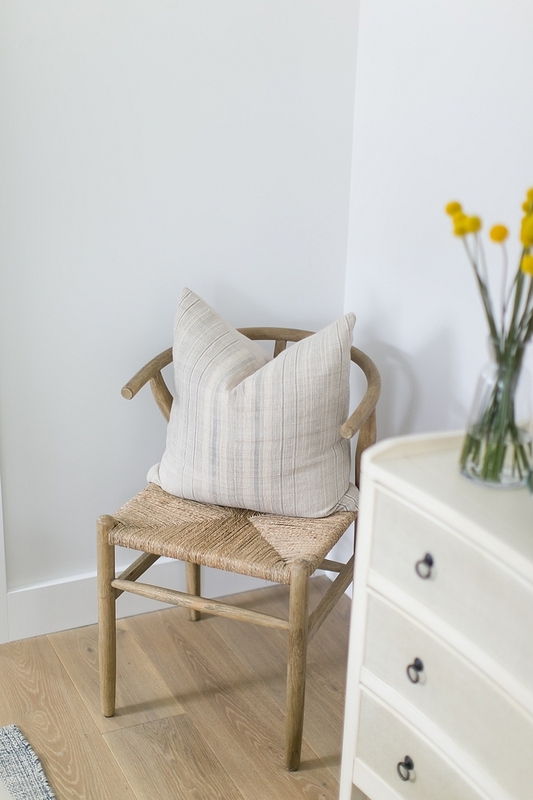 Vanity Stool: here – similar. Floor tile is Mission Tile West Danube Blue Limestone set in a herringbone pattern – similar here. Chandelier: Arteriors, Aiden (discontinued) – similar here – Other Chandeliers: here, here, here, here, here, here & here. 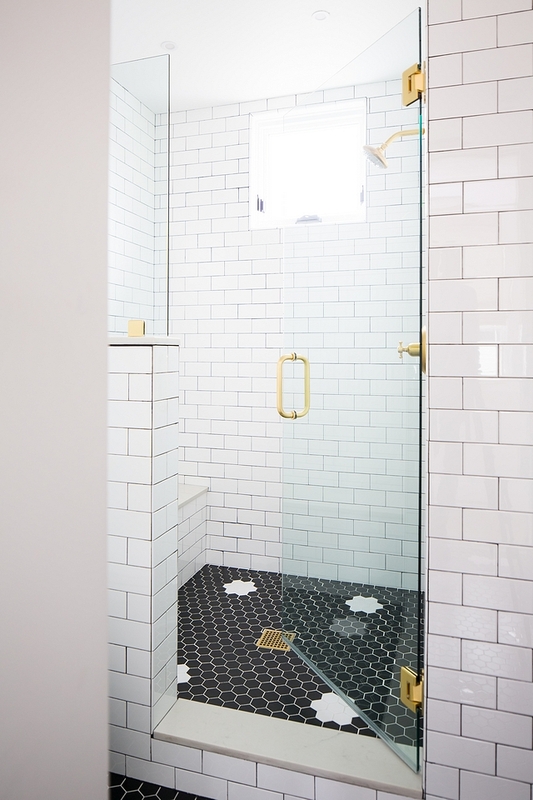 The shower features a white subway tile on walls and the same herringbone Blue limestone tile. I really like using the same floor tile in the entire bathroom because it makes the space feel larger and less busy. 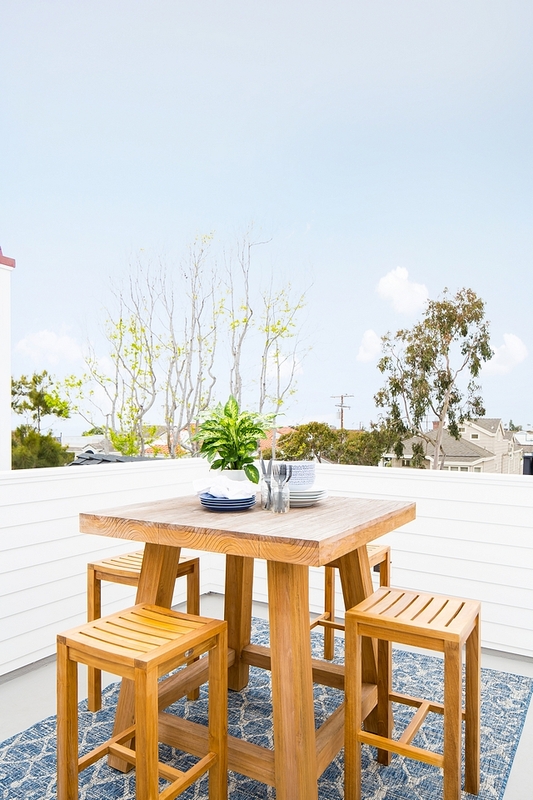 Beautiful Outdoor Tables: here, here, here, here & here. 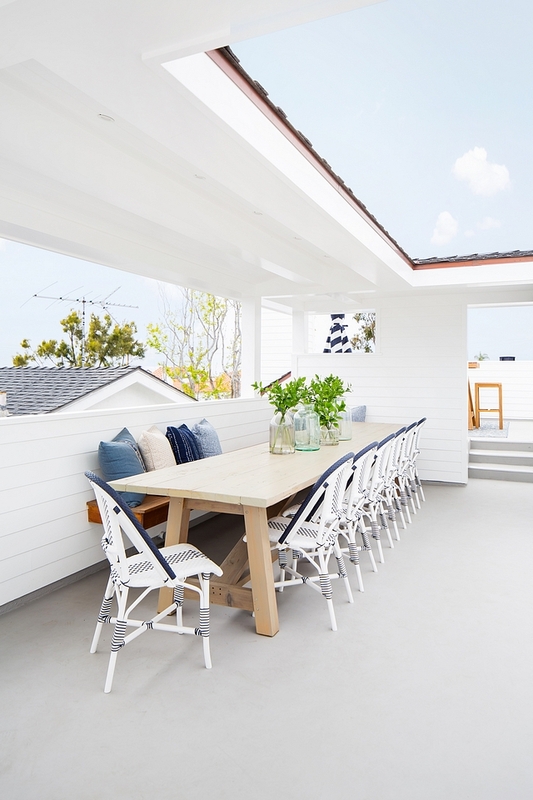 Dining Chairs: Serena & Lily, Riviera Outdoor Side Chair. Bar Table: Teak Warehouse, Blok Teak Outdoor Bar Table. Stools: Teak Warehouse, Maid Reclaimed Teak Bar Stool. Chaise Lounges: Teak Warehouse, Tango Teak and Mesh Sun Lounger – similar here. Striped Umbrellas: Crate & Barrel, 9’ Round Sunbrella Cabana Stripe Navy Patio Umbrella. Many thanks to the builder & designer for sharing the details above! Serena & Lily: Free Shipping. 30% Off Bedding!